This involved complete removal of the old asphalt, down to the foundational sub base. We used our Wirtgen 1200 milling machine to grind up the old asphalt, which we took back to the asphalt plant for recycling. After completely re-compacting the sub base, we then installed the new asphalt roadway to the specified depth. So be sure to check references and look into previous jobs done by potential municipal paving contractors. With changing laws, codes and public concern about environmental quality standards, it is essential to choose a municipal paving contractor that not only understands these requirements, but has demonstrated an ability to meet and exceed all environmental regulations, particularly as to the quality of storm water runoff. Espina Paving is extremely concerned about the environmental impact of all of its jobs and has adopted environmentally-conscious paving practices, including porous asphalt surfaces. This type of asphalt surface actually filters stormwater runoff so that it is far cleaner when it reaches Northern Virginia streams and rivers. 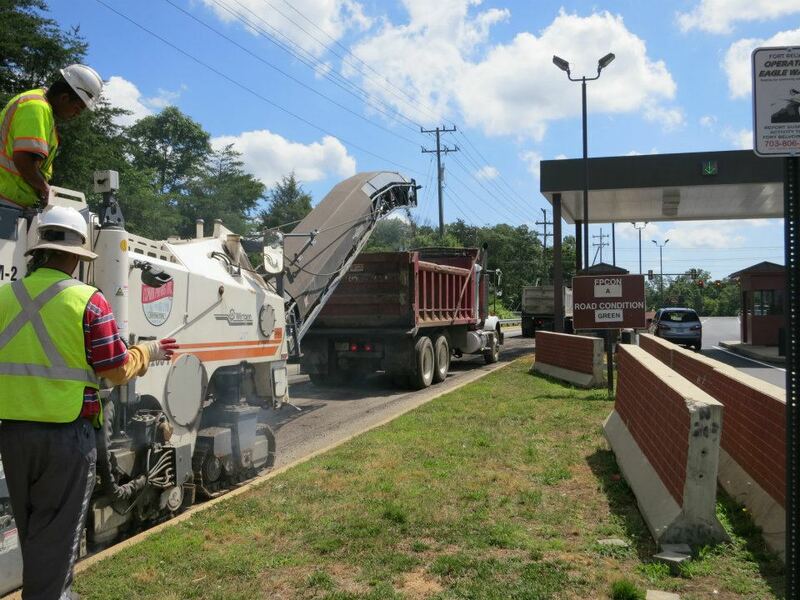 In addition, Espina recycles nearly all of its materials and uses recycled materials, with the latest technology, to install cleaner, stronger pavement in all of its jobs while drastically reducing the need for landfill space. That’s something everyone in town can feel good about! If your town needs new roadways paved, contact Espina Paving—we have the experience, technology and professionalism you need for your municipal paving project. Call us today at (703) 491-9100 or fill out our contact form to discuss your town’s needs.